The Peugeot 208 is a supermini (B-segment in Europe) produced by the French automaker Peugeot, and unveiled at the Geneva Motor Show in March 2012. The first 208 models were three door hatchbacks produced in 2011, at the company's new plant in Slovakia. In June 2012, as five door hatchbacks became available, production of the 208 also commenced at Peugeot's French plants at Mulhouse and at Poissy. The 208, developed under code name "A9", is built on the PSA PF1 platform and the weight is to be reduced by 173 kg (381 lb) (110 kg (243 lb) on average) compared with the 207 and still offer more space than the predecessor. The boot offers 285 L (10 cu ft) (VDA) of space, 15 L (1 cu ft) more than the 207, and the leg room in the rear seat increases 5 cm (2 in). The design was led by Pierre Authier, with Sylvain Henry as exterior designer. The interior design is by Adam Bazydlo, and the colour and trim is by Marie Sanou. The car features a tablet computer like screen, and panoramic glass roof surrounded by LED lights. The car is relatively aerodynamic with a drag coefficient, Cd, of 0.29. 2 emissions of 99 g/km or lower. In addition to the four cylinder petrol engines carried over from the previous model, from September 2012, the 208 has been offered with two new three cylinder units with variable valve timing – the 1.0 VTi (68 hp) and 1.2 VTi (82 hp). 2 emissions value of 99 g/km. A 1.2 L three cylinder is available with a turbocharger designated as the PureTech 110 S&S (available on the GT Line models and the allures) or without designated PureTech 82 S&S (available on the active, VTi, or XS). This engine is coupled to a five speed manual or a six speed automatic. The 208 GTi is fitted with a 1.6 litre turbo (1,598 cc) four cylinder in line turbo petrol Prince engine producing 197 bhp (147 kW) at 5,800 rpm and 203 lb⋅ft (275 N⋅m) of torque at 1,700 rpm, and is fitted with a six speed manual transmission. This first GTi model has since been replaced by the 208 GTi by PeugeotSport which is directly derived from the limited edition '30ème Anniversaire Edition' which put out 208 bhp with revised suspension and an optional two tone paint job, along with a facelift of the original bumpers and other small changes. The GTi's Prince engine is shared with the Mini and various Citroëns. The range of diesel units starts with the four cylinder 1.4 e HDi unit, originally introduced in 2010 for the 207, which provides 50 kW (68 PS; 67 hp) of power coupled, in the 208, with published fuel economy and emission figures of 3.4 L/100 km (83 mpg‑imp; 69 mpg‑US) and 87 g/km. Active - Available with either a 1.2L Purtech 82 S&S Petrol or a 1.5L BlueHDi Diesel, both come with a 5 speed manual. Signature (also known as the allure) - Comes with the same engine and gear box as the active but has different styling and alloys. GT-Line - This is the top of line model that is available from Peugeot. Coupled with the 1.2L 110 engines both 6 speed automatic and manual as well as the 1.5L Diesel. This trim offers all the styling off a hot hatch, it has 16" alloys which are diamond cut. GTi - As off 2019 this model is not available to purchase from Peugeot. The second generation Peugeot 208 was unveiled at the Geneva Motor Show in March 2019, and is expected to go on sale across Europe over the summer. Also revealed at the Geneva Motor Show was a fully electric version, the e 208. The petrol engines are all 1.2 litre, three cylinder turbos with 74, 99 and 128bhp. The diesel model will come in just one engine variant, a 1.5 litre four cylinder engine producing 99bhp. Peugeot have yet to announce the sport models and what engine they will be using, such as the GTi which has been part of the family of the 208. In April 2013, a 208 T16 was tested by Sébastien Loeb at Mont Ventoux. Loosely based on the shape and design of the production 208, the T16 is a lightweight 875 kg (1,929 lb) vehicle that uses the rear wing from the Peugeot 908, and has a 3.2 litre, twin turbo V6 engine, developing 875 bhp (652 kW; 887 PS) with the aim of competing at the Pikes Peak International Hill Climb. At Pikes Peak on 30 June 2013, Sébastien Loeb used the 208 T16 to break Rhys Millen's record time, set in 2012 on the first fully paved roads in the history of the competition. The previous record of 9:46.164 was shattered, and a new record time of 8:13.878 was set. The car also won the hillclimbing race, at the 2014 Goodwood Festival of Speed in June 2014. Team Peugeot-Hansen won the manufacturers title at the FIA World Rallycross Championship in November 2015. Jérôme Grosset-Janin was runner up in the FIA European Rallycross Championship in the same year. Juha Salo won the Finnish Rally Championship in 2015 and 2016. Peugeot announced the 300,000th 208 was produced in February 2013. 2012 242,900 220,800 Total production reaches 243,600 units. 2013 333,800 334,439 Total production reaches 577,400 units. ^ "Professional MBA Automotive Industry: Factory visit and workshop at PSA Peugeot Citroën in Trnava". tuwien.ac.at. ^ "Avec la 208 PSA Mulhouse voit la vie en rose". La Tribune. ^ "Peugeot Algérie : Ouverture des pré-commandes sur la 208 Tech Vision made in Algérie". Autobip (in French). 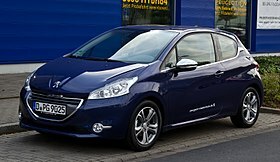 ^ "Peugeot 208 Arrives in Europe Next Spring". Inside Line. 4 November 2011. Retrieved 26 July 2012. ^ 2012 Peugeot 208 Design Details Archived 2012-01-25 at the Wayback Machine by newcarspec.com 2011-11-16 visited 2011-11-22. ^ English, Andrew (4 April 2013). "Peugeot 208 GTi review". The Daily Telegraph. London. Retrieved 26 August 2013. ^ "New 2019 Peugeot 208 and e-208: the full story | CAR Magazine". www.carmagazine.co.uk. Retrieved 2019-04-17. ^ "Peugeot reveals full spec of Loeb's 875bhp, 875kg Pikes Peak T16". Autosport. 23 April 2013. ^ "Sébastien Loeb breaks Rhys Millen's time at Pikes Peak". Pikes Peak International Hill CLimb. PPIHC. Archived from the original on 23 July 2013. Retrieved 11 July 2013. ^ "Sébastien Loeb breaks record". Retrieved 16 July 2013. ^ Jonathon Ramsey. "Sebastien Loeb demolishes Pikes Peak record with an 8:13.878 [UPDATE: w/video]". Autoblog. ^ "875bhp twin-turbo Peugeot 208 T16". Autocar. Retrieved 14 June 2013. ^ "Peugeot produces its 300 000th 208". Peugeot. 26 February 2013. Retrieved 14 June 2013. Wikimedia Commons has media related to Peugeot 208 A.